Philips' brand-new TV concept, the 21:9, was announced last month to much fanfare. The television is reportedly the first of its kind to offer true cinema ratio in your home – hence its 21:9 moniker. When we last reported on the TV, there was no announcement regarding when the set would be released in the UK, with Philips telling us it was still in its 'prototype' phase. This got us wondering if we were actually going to see it at all this year. Turns out, the TV will be released in June, with an expected street price of €4000 – around £3,500. We'll admit it, the price is a little steep for our liking, especially considering the current economic times. 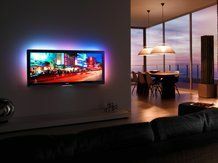 The TV will be one of the first, however, to offer something called Net TV in the UK, where you will be able to get the likes of YouTube, TomTom, eBay and Netlog all from the comfort of your telly.